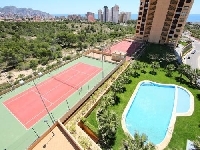 VILLAS AND APARTMENTS TO RENT IN BENIDORM, SPAIN. Welcome to our selection of holiday homes to rent in Benidorm, Spain. Benidorm, located on the east coast of Spain, is one of the most popular and well known resorts in the whole of Europe. A sea of high-rise hotels and apartments, it is also home to thousands of bars and restaurants, all serving English food and English beer. If you're looking for an authentic piece of Spain, you'd be best to visit one of the nearby towns or find Benidorm old town; but if you're looking for a great family destination, with beaches and theme parks, then you need to look no further than the �Manhattan of Spain�. Whatever age your kids and whatever their interests, there is likely to be a theme park either in Benidorm or the surrounding area that will appeal to them. Take advantage of the great weather on the Costa Blanca and visit Aqualandia water park, with its slides and selection of pools. Wet entertainment of another kind can be found at the Mundomar, including a giant aquarium and live shows featuring dolphins and exotic birds. Terra Natura is a zoo with a difference, where visitors are allowed to interact with the animals, by helping feed them or taking part in shows. The park also has a swimming pool area with slides and even a spa for Mum and Dad to relax in. Teenagers will be begging for a day at Terra Mitica, a fun fair with a huge variety of rides, from roller coasters to dodgems. Even younger kids are catered for with live shows in different themes and there is cheaper entry if you just want to go on an evening. 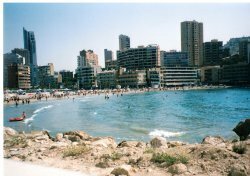 There are three beaches in Benidorm, but the main one that everyone has heard of is the long expanse of sand called the Levante, This was where the original resort sprang up in the 1950s and as well as being a great place to sun yourself, it is also where most of the accommodation and restaurants can be found. The promenade is entertaining on an evening, when buskers and stalls offering local crafts and hair braiding or henna tattoos line the walkway. The old town is now well hidden away amongst the towering hotels and apartment blocks, but if you can find it, then the narrow, peaceful streets make a pleasant change from the bustle of the resort. The white balcony in the centre of the old town, quite a climb up from the sea, gives you a great view and allows you to see just how big the town has become. Looking for self catering holiday accommodation in Benidorm? Then below is a selection of apartments in Benidorm and villas in Benidorm that can be rented direct from their owners. You can either click on each listing for further details or you can use our search engine on the left if you are looking for something in particular.